"[A]n independent Palestinian development and training institution." Ma’an Development Center’s donors include: Norway, Australia (Australian Embassy, AUSAID), Human Rights and International Humanitarian Law Secretariat (joint funding from Sweden, Switzerland, Denmark, and the Netherlands), France, United Kingdom, Canada Fund, CARE International, Caritas, and Oxfam Novib (the Netherlands). In 2017-2018, Ma’an Development Center received DKK 3,075,193 from DanChurchAid (Denmark). In 2015-2017, Ma’an Development Center received NOK 3.6 million from Norway. In 2012–2014 was granted €139,550 from France via Association France Palestine Solidarité (AFPS) to assist farmers in the Jordan Valley to develop date agriculture. Ma’an Development Center received $348,578 from France in 2011-2012, as a part of the NGO Development Center’s (NDC) Fourth Palestinian NGO Project (PNGO IV). Main office located in Ramallah. Branches in Gaza, Khan Younis, Tulkarem, and Jenin. Ma’an’s mission is to “partner and work hand in hand with Palestinian NGOs” towards sustainable human development through: development of Palestinian human resources, institutional building, conducting developmental research, and creating sustainable agricultural models. Ma’an Development Center cooperates with the Ecumenical Accompaniment Programme in Palestine and Israel (EAPPI). EAPPI sends volunteers to the West Bank to “witness life under occupation”; upon their return, many of these volunteers promote BDS in their home countries. Published “Boycotts, Divestment & Sanctions: Lessons learned in effective solidarity” (2009), a guide to grassroots and international BDS campaigns. 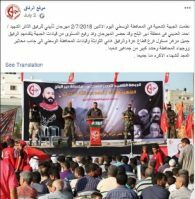 MA’AN’s publication, “2017 Diary,” blamed Israel for the humanitarian crisis in Gaza and provides legitimacy to Hamas’ rule, referring to it as having been elected through “democratic elections,” blaming Israel for “Palestinian internal division,” and having “intentionally crippled and undermined a functioning and sovereign state.” The document makes no mention of that fact that Hamas is designated a terrorist organization by the U.S., Canada, the EU, and Israel. During a July 2, 2011 hearing of the Australian Senate’s Foreign Affairs, Defence, and Trade Legislation Committee, Senator Eric Abetz asked officials from the Australian Agency for International Development questions regarding funding to Ma’an Development Center. Member of the “Displacement Work Group,” an initiative of Badil and OCHA to “monitor human rights violations (evictions, home demolitions, land confiscations) resulting in the displacement of people from their lands and communities,” along with: Addameer, Al-Haq, Al-Mezan, AIC, ARIJ, Badil, BIMKOM, B’Tselem, CARE Intnl., DCI – Palestine section, Diakonia, EAPPI, Ir Amim, ICAHD, Medical Aid for Palestinians, Oxfam UK, Oxfam Solidarite – Belgium, PA Govt. Spokesperson, PCHR, RHR, Society of St. Yves, Save the Children UK, Shatil, UNFPA, Stop the Wall, ACRI, UNFPA, Yesh Din, and World Vision. Member of the Palestinian Grassroots Anti-Apartheid Wall Coalition (PGAAWC).